Ornate pictorial calligraphy, or "flourishes" as they are sometimes called, are working their way back into the tattoo world as well as into current pop culture. In fact, this year the United States Postal Service released a stamp titled "Our Wedding Stamps" that featured an elegant bird flourish. The history of this art finds its roots in Arabic script dating back to the 9th century. Elaborate "thuluth" script had entire phrases that were written without lifting the pen from the paper. Fast forward to the 15th century when pictorial calligraphy had become an art form and the wealthy had writing masters and instructors to teach penmanship. These masters often produced a copybook of their lettering and design styles which would influence other artists. 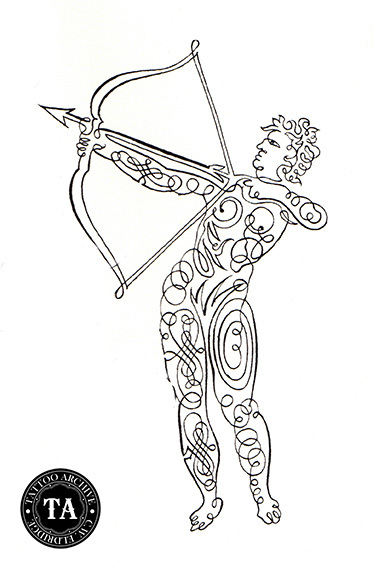 Dover Publications has published the copybook of Baldri van Horicke, who was a 17th century Belgian writing master and instructor at the court of the Spanish Hapsburgs in Brussels. 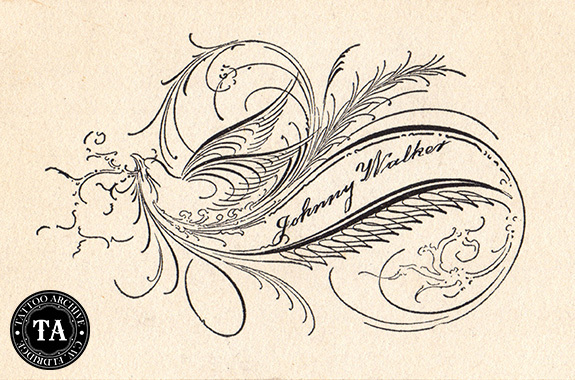 Horick's calligraphy was described as going far beyond the formation of letters. He created elaborate ornamental scrollwork and pictorial figures that came to dominate the process of writing. The art of penmanship in the United States reached it peak at Zanerian College in Columbus, Ohio. Established in 1888 by Charles Paxton Zaner, the school prepared students for careers in penmanship at a time when most documents were written by hand for business and industry. But not all of these writing masters ended up in business world. A few choose the carnival midway as their work place, and here is where our story takes a sharp turn into the tattoo world. Early in Paul Rogers' tattoo career he tattooed on carnival mid-ways. 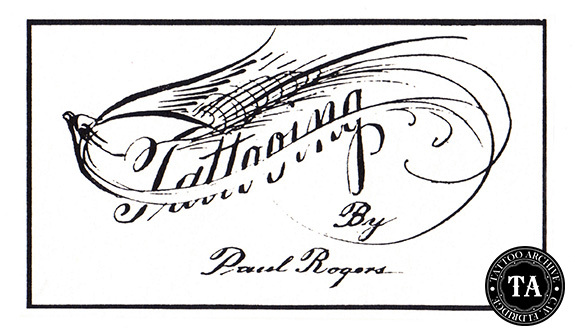 When he met a flourish artist working the crowd, he would have them create a calling card for him, there were several of these cards in Paul collection. Johnny Walker learned tattooing from Rogers & Spaulding and later spent time tattooing with Sailor Jerry Collins in Honolulu. 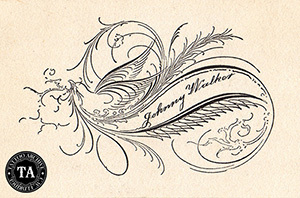 Walker also appreciated the art of flourish and had several calling cards created for him. Generally these calling cards were about the size of a business card (2 x 3 1/2) and hand drawn on heavy card stock. "The law of harmony in flourishing is the same as in love. As long as everything goes along smoothly, harmony prevails. But as soon as some rival crosses the pathway, especially in a diagonal way, there is likely to be trouble in camp. Therefore see that lines run nearly parallel or cross nearly at right angles".